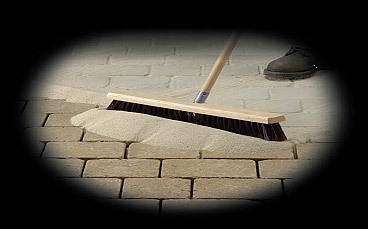 TECHNISEAL POLYMERIC SAND FOR PAVEMENT JOINTS is a high-tech mix of graded sand and binder, specially formulated for the filling of narrow or wide joints when installing pavers or slabs, or when replacing existing joints. Unlike conventional sand, it stays in place and remains stable. This HIGH-PERFORMANCE mix, made of the latest generation of polymers, provides unrivalled effectiveness and durability. It is specially formulated for the filling of paver and slab joints in highly-exposed areas: public ways (subject to heavy traffic and intensive cleaning), sloped driveways (subject to fast erosion due to run-off), pool decks (frequently soaked), etc. It is also recommended for the replacement of existing joints. This product, that resists weather quickly after being activated, is designed to make joint stabilization easier than ever. It is recommended for the filling of paver or slab joints on surfaces exposed to normal traffic, such as driveways, terraces, backyards, garden paths, access roads, etc. To learn more about Polymeric Sand/Pavers visit the pages below.